I lived about 12 miles from where all of my friends lived, in a different town. There were only so many telephone circuits between the two towns, so it was one of those loathsome situations where calls were long-distance unless you kept hitting redial a thousand times until your call went through for free. Long distance in those days was a big no-no because back then, phone conversations with friends and boyfriends could span hours. Parents brandished phone bills angrily in the air, demanding to know the meaning of a call that cost $5.62. That’s right. We talked on the phone. We relished extended periods of verbal communication that did not require our necks to bend perpendicularly to our developing spines, nor the exploitation of our thumbs. We laughed. We gossiped. We were comfortable with long pauses. There were “be right back” pee breaks when we were unwilling to hang up the phone for fear of losing the sacred non-long-distance connection. I begged for my own phone. I had the kind you could get for $9.95 at K-Mart, with the buttons in the handset. Phones used to emit a satisfying plastic-y clack when the handset met the hook. I’d twist the cord around my finger or around itself until it became a tangled knot that squeaked like only the gummy membrane of a phone cord can. I also had a sweet Garfield phone. Do you remember those? My friend Heather gave it to me in junior high. Occasionally, during late night calls, my boyfriend and I would hear a muffle or nearly inaudible click that signaled someone may have picked up the other line. We’d freeze, holding our breath, hoping we hadn’t been caught talking at 12 a.m. on a school night. In which case a baritone voice would interrupt the call by saying, “You’d better get off this phone right now” through clenched teeth. When it was my dad, I’d follow a pattern: 1) squeak “Bye!” and hang up 2) come to Jesus immediately and 3)break up with Boyfriend the very next day because I’d disappointed my father, and that required a complete reevaluation of my life and a future that didn’t involve boys. Anyway, I chuckled to myself while lying in bed the other night, thinking about those nights I got in trouble for being on the phone late with my boyfriend (who incidentally ended up being my husband and with whom I had the son who inspired this blog). I thought about our little almost-3-year-old dude and what it will be like for him someday, and I was a little sad. I’ll never do that, I thought. I’ll never pick up the phone one night twelve years from now to see if my son is on the line past bedtime because there will be no line to pick up. There are no circuits to break through and phones no longer come in two pieces linked by a vinyl curly-Q. He won’t spend hours on the phone, because our silly culture has run away with us to Pleasure Island where we’ve eaten the ice cream and smoked the cigars and upgraded our smart phones until we grow long brown ears and tails and—HEE HAW! – we become jackasses who text and drive, “sext” naked pictures of our hoo-hoos, capture videos of victims rather than helping them (but not without snapping a selfie first)…you get the picture (pun intended). But it’s no wonder texting is preferred in the absence of a cord to occupy our fidgeting hands. 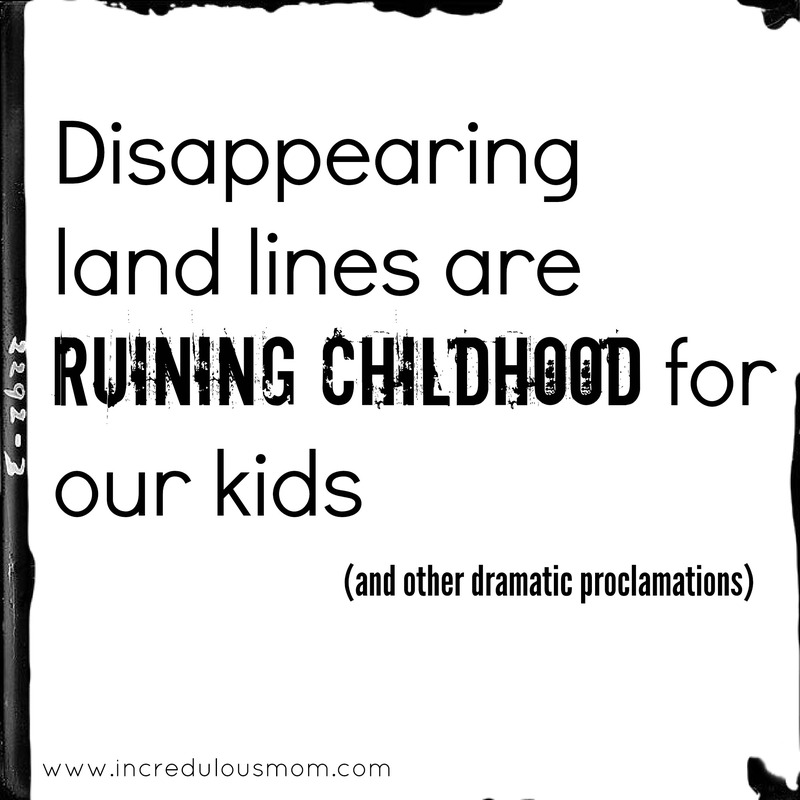 Yes the absence of land lines has caused quite a pickle. The dominos have toppled from one to the next until every aspect of our future has been altered. Prank calls, people. Prank. Calls. Don’t pretend you’ve never done it. Call so-and-so’s mom from a slumber party and pretend you’re selling condoms at a discount, even though you really had no clue what that even was. Dial 1-800-TAMPAX and giggle while telling the operator on the other end “It’s stuck in there. 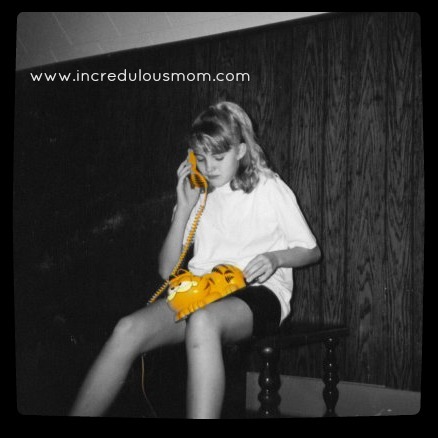 I can’t get it out!” Then dial back and order free tampon samples but have them sent to the boys in your class, getting their addresses from the … wait for it … phone book. (Side story: This one time some boys in our class prank called my house while I was out at my friend Heather’s house. My dad answered. The boys pretended to be radio DJs and told my dad I’d won something. He muttered that I was over at my friend Heather’s house and they immediately said, “Ok, thanks! Bye!” and hung up the phone. It didn’t take Dad long to realize he’d been pranked, which really pissed him off. He showed up on Heather’s doorstep in record time following the call, demanding to know who the pranksters and where they lived. I gave him vague directions to prevent Dad from verbally kicking their asses. You’re welcome, boys.) But *69, followed by caller ID, followed by cell phones took away forever, the rite of passage known as: the prank call. Pardon my Andy Rooney-ness. I get it. I’m not mad at technology, which provides enjoyment, convenience, and value. I simply feel that it may have pickpocketed a few precious coins from the sacrament of childhood, as experienced by my generation. Who knows what fresh hell adolescence will bring for today’s toddlers. It’s too soon to tell. I only know that long talks on a school night about someday “moving to the city” won’t resonate from a landline. Now if you’ll excuse me, I need to check out Pinterest. I want some DIY ideas for upcycling old telephone cords. Chrisy, Chrisy, Chrisy! How did you get so insightful and at such a young age? Another great one, Chris!! Too bad you are too young to remember party lines. Now those were the bane of all teenagers’ existence! Somebody could actually listen in and tell your mom what you were talking about. Had to develop an extra-keen ear for that almost inaudible “click” when somebody picked up. Always a nearby neighbor – party lines were all connected by one line AND one road usually. So your neighbors knew your business like nobody else. This was another great post and BTW – use that cord for key chains. There is no other use…..I’ve tried! 🙂 Keep it up!! Love every one of your posts!! I can’t imagine party lines! How awful!! We’ve come a long way!